Featuring both indoor and patio (BYOB) dining until 10:30PM this First Friday. Menu special for the night include Mediterranean mussel stew, Opah served over Moroccan mashed potatoes, and Mrouzia (braised oxtail) with ras el hanout (North African spices). 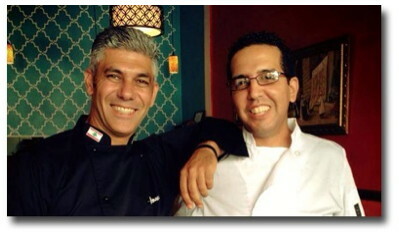 Chef Kamal Jemmari was born in Marrakesh, Morocco. He credits his family and his hometown for his love and dedication to bold flavors and fine cuisine. Spending his early years learning from his own mother and father's kitchen and the legendary markets of Marrakesh, Chef Kamal began his career in the restaurant industry in a fine dining Spanish Tapas restaurant in New Haven, Connecticut. Since then he has offered Latin, Italian, local Hawaiian and global cuisines to the islands. Now returning to the authentic style of his own regional cuisine, Kan Zaman's menu stands alone as the only restaurant in Honolulu to offer Moroccan and Lebanese cuisine. Sahteyn' is a word you will often hear in a Lebanese home -- loosely translated it means ‘twice your health' -- a form of welcome to join a family and share delicious food. Lebanese cuisine is generous and abundant. In a Lebanese household, food is life and sharing it is one of the great joys of being alive. And even for simple dinners at home, there are a variety of dishes on the table, the meal starting with small portions known as mezza which centres around dips and salads. Lebanese food is one of the freshest and most delicious on the planet. Lamb is the meat of choice and appears in many dishes including kafta in which minced lamb is rolled into sausage shapes and cooked on the barbecue or in the oven. Sweets are pure artwork, -- there are many variations of filo pastry combined with nuts and syrup; there are creamy sweets filled with a clotted cream called ashta plus melting shortbread sometimes filled with a date paste or nuts and much more. Sweets are generally served separately to a meal with black coffee or tea. So, Sahteyn -- welcome to a great cuisine. 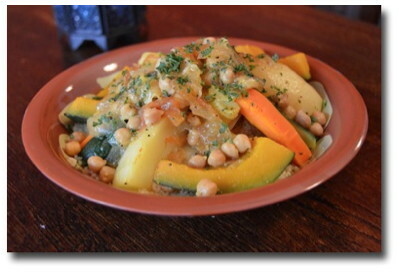 Moroccan cuisine is the culinary star of North Africa. Being at the crossroads of many civilizations, the cuisine of Morocco is a mélange of Arab, Berber, Moorish, French, Middle Eastern, Mediterranean African, Iberian, and Jewish influences. Moroccan cooking is enhanced with fruits, dried and fresh -- apricots, dates, figs, and raisins, to name a few. Lemons preserved in a salt-lemon juice mixture bring a unique face to many Moroccan chicken and pigeon dishes. Nuts are prominent; pine nuts, almonds, and pistachios show up in all sorts of unexpected places. Moroccan sweets are rich and dense confections of cinnamon, almond, and fruit perfumes that are rolled in filo dough, soaked in honey, and stirred into puddings. Spices are used extensively in Moroccan food. While spices have been imported to Morocco for thousands of years, many ingredients, like saffron from Taliouine, mint and olives from Meknes, and oranges and lemons from Fes, are home-grown. Common spices include cinnamon, cumin, turmeric, ginger, pepper, paprika, anis seed, sesame seed, coriander, parsley, saffron and mint. 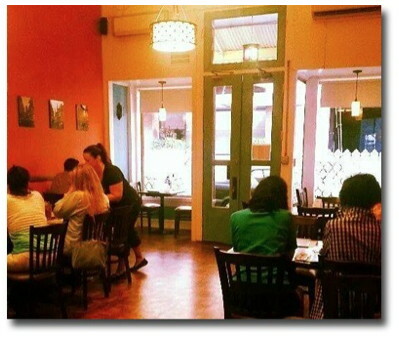 We are one of very few restaurants open in Chinatown for late lunch so come on in! Authentic Moroccan & Lebanese Restaurant. 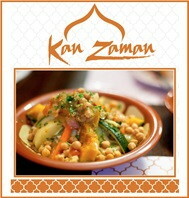 Kan Zaman's menu stands alone as the only restaurant in Honolulu to offer Moroccan and Lebanese cuisine.